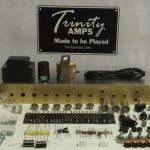 Trinity Amps offers players an economical Do-It-Yourself way to build you own Trinity Amp. Some Kits include our excellent Heyboer Transformer sets and tubes are included where noted. This is noted for each kit. Just to let you know, nothing was more satisfying than having my amp power up and work perfectly the first time! Quiet, no hums or crackles, and nice and very sweet sounding with my strat plugged in. Thanks a bunch for the kit. I'm super stoked about my TC15. Very satisfied customer! 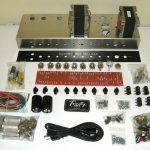 These are high quality DIY kits using the same parts that we use on our amp builds. 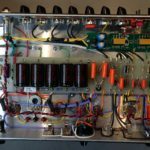 We have had many first-time builder successes but we do recommend that you be familiar with high voltage tube amp construction, safety and troubleshooting and be able to read schematics, layouts and posses solder skills in order to assemble any kit. 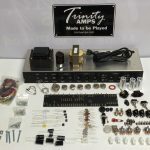 The Trinity 18 is based on the Marshall 18 watt design and uses a pair or EL-84 output tubes, 3 12AX7 preamps, and an EZ-81 rectifier. It is a Cathode Bias, all-tube design using a tube rectifier. The Trinity TC15 faithfully reproduces both Matchless and VOX amp tones. The two channel, TC15 is a 15 watt amp with two very different VOX derived channels. One is sweet and one is tough. The Tweed produces about 15 watts into 8 Ohms using two 6V6 output tubes and uses a replica Fender #108 4, 8 ohm design Output transformer built by Heyboer. A redesigned 5E3 layout helps reduce hum and noise. Custom Lead is a special head amp based on the classic design originally pioneered by HIWATT. This amp has a preamp inspired by the DR103 preamp and has 3 inputs - one linking the two channels. 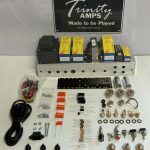 A unique Single Ended Class A gigging/studio/practice amp that covers a full tonal spectrum. From Clean to Dirty - Tweed to Marshall. With a variable power control that allows you to brown the sound. Finally, an Ampeg B15 Kit!! Based on several years of vintage Ampeg B15 designs, the Trip Top combines the original circuits of both the Ampeg B-15NC (1964, tonestack after volume) as well as the later B-15NF (1965-67, tonestack before volume). A sweet little 5 watt amp based on 50s Fender Champs & Gibsons that accurately produces a warm, growly, Chicago Blues tone in a grab-and-go package. By-passable Tone control. NOS 6SJ7 preamp tube included with tube set. Simple enough for a first build. 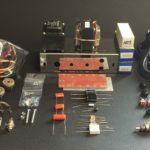 After many inquiries about an Overdrive Special Design kit, we re-designed our OSD into a builder friendly package that meets out stringent support requirements. The VRM (Voltage Regulation Module) is designed to control the power level of your Cathode Biased amp while retaining the tone. The 1" sq. 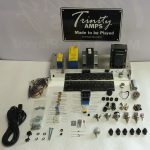 board should fit anywhere in your Trinity Amp with three simple connections. 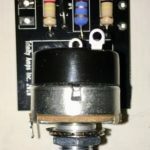 Replace the power switch in your amp using the "switched" control pot. 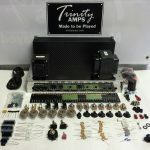 We offer our Trinity built boards for your DIY project. These are the same boards we use in our completed amplifiers. These boards use turrets.